When I fell for adventure racing, I knew nothing about it beyond what I’d seen on Checkpoint Tracker’s live race coverage, but that soon changed. Over the next year, I embarked on my own personal course in adventure racing, and though my first official race was hardly a resounding success (we were disqualified for missing the time cut-off), it was an absolute blast. I attribute my ability to have fun even while lost in the woods after 13 hours of racing to the mental preparation my personal adventure network afforded me. In education, the concept of the Personal Learning Network (PLN) is currently popular. Basically, your PLN is a network of resources — blogs, websites, and individuals — that inform and inspire you in your career. Similarly, I think aspiring (or active) adventure racers can benefit from building a personal adventure network. You just can’t overestimate the benefits of knowing what to expect, learning answers to questions you haven’t even thought of, or just seeing a familiar face out on the course. 1. Explore race websites: These include basic details about the races and required gear lists. Some have suggested links to organizations where you can learn more about facets of adventure racing (orienteering clubs, for example). Many will list the teams who are already registered, along with links to their websites/blogs. 2. Blogs are your friend. I read every word of my friend Patrick’s post about his first adventure race and then looked up his ROCK Racing friends who had also competed. If you don’t have a personal AR connection, start with the teams listed on your target race’s website or google “adventure race”, “adventure race reports”, or the name of any race or team that has caught your eye. Blog posts are filled with helpful information and can give a clear picture of the ups and downs of a long adventure race. 3. Be a Facebook stalker: Many teams also have Facebook pages. “Like” these pages and you can read about their training and upcoming races, view race pictures, and see links to adventure racing articles you might never have come across. 5. Don’t overlook the little guys: While I logged a lot of time following perennial front-runner Tecnu‘s progress at the AR World Championships and always benefit from Emily Korsch‘s race lessons, seeing top teams in action is like watching Olympic gymnasts: the things they make look easy are well beyond my abilities at this point. You can also learn a lot from middle-of-the-pack teams, who often come by their lessons the hard way. With careful reading, maybe you’ll avoid those particular mistakes. 6. 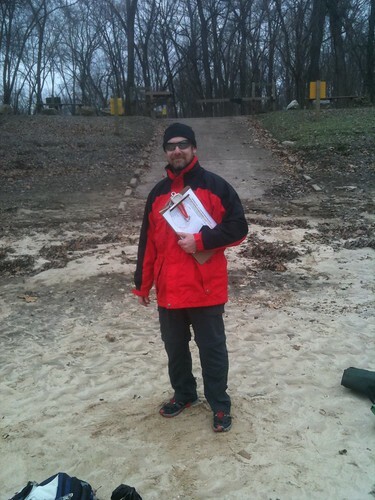 Volunteer: Once the race reports failed to scare me away from adventure racing, my next step was volunteering at a race. It can be surprisingly fun (even in 20-degree weather), and volunteering offers you an up-close view of adventure racing. My volunteering partner looking official(ly cold). Since many volunteers are also adventure racers, you’ll add to your AR contacts. Of course, you’ll also see plenty of race staff and participants. They may to be too busy for introductions, but just by being there you’re becoming a more familiar face and helping support a sport you love. 7. Join the club: Orienteering is vital in an adventure race, and mountain biking and paddling are generally featured as well. Some races may include rock climbing or kayaking. Your skill level in any race discipline will definitely impact your success on race day. Look for clubs or groups targeting these sports and join in some of their activities. You’ll have fun and develop your skills while meeting like-minded people (and potential teammates). 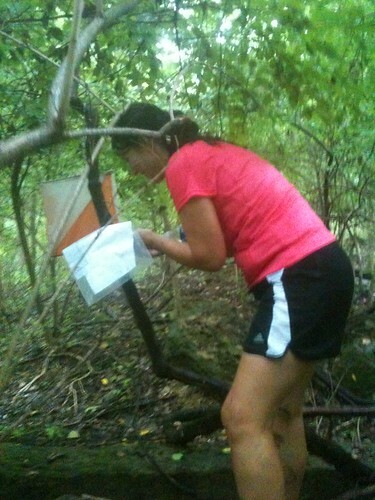 Practicing my navigating skills at an orienteering meet. 8. Say yes: If a team you’re following online hosts an open event and you can go, do it. You’ll meet cool people and gain experience. My first taste of adventure racing was at a “non-race” hosted by a team based 2 hours away from me. While it was no picnic convincing my husband it was a good idea for me to spend the day in the woods with a group of strange men, that 9 hours cemented my love for adventure racing. 9. Jump in: Preparation and contacts are good, but in the end, the best way to learn about adventure racing is to do it. Find a teammate, pick a race, and enter. 10. Complete the circle: After all you’ve learned from others, wouldn’t it be nice to give back? If you’re so inclined, start your own blog. Share your training, funny stories, race reports, triumphs, and failures. Blogs afford the ability to connect with others, obsess in print about favorite topics, and collect great memories and pictures in one place. Platforms such a Blogger, WordPress, and Weebly offer free blog hosting and are pretty simple to negotiate. Use these ten tips and before long your calendar will be full of fun training opportunities and your adventure races will be full of familiar faces.